With a record 750 cars showing at the February 2014 Cars and Coffee monthly event in Austin Texas, there were all sort of unusual cars to get up close to. Including classic, exotic, European, Japanese, off-road, military, race cars, tuner cars, drift cars, stretch limos, and the usual assortment of the usual muscle cars. But perhaps the most unusual car here, a Tesla Model S, is one of the most interesting because it is so different from the rest. We had an extended test drive last year and it was the most unusual car we drove in 2013… and yet it was as easy or easier to drive than a conventional car. And surprisingly fun with its enormous – and instant – torque. If this is the future, it’s terrific. And a large and very active Tesla owners association in Austin proves it. 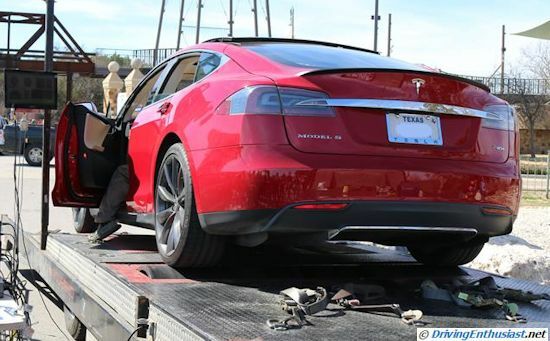 An attempt was made today to dyno one particular Model S – an attempt that failed. As background, the Tesla Model S (with the optional 85 kWh battery pack and motor) makes 416 HP and 443 torque, from a single electric motor that spins at something like 12k RPM. There is no transmission, and nothing that could conventionally be called a driveline, just a very little friction from the short shaft from the electric motor thru to the wheel bearings. So on a dyno, at the wheels, it should make almost that much power. Very little loss as compared to a conventional car that loses 15-20% thru the friction in its driveline. But the dyno was a failure… since there is no spark plug there was no place to connect the sensor to get firing order. A driveshaft sensor might have worked to get some idea of RPM but it was impossible to reach. An attempt to place a magnetic dot on a wheel gave a false reading. And while the dyno people didn’t have an OBD-II connector, and their software wouldn’t have understood what it was reading anyway. So the Tesla ran twice on the dyno without full results, only a torque reading of 404, and it was interesting to see it spin up to high RPM with zero noise, other than the friction of the tires on the dyno roller. And crowd was fascinated – and respectful.